Try as we might, we still go long tonight. We answer some listener voicemails, I say 13th when I meants to say 23rd and Vanwall asks for us to put everything together on a DVD from our MTTS coverage. Plus, news of the week. A bit of a new way, let us know what you think. Why is there an H3 as this shows graphic? Would you like to be able to have a DVD of our MTTS coverage? All of the audio and possibly some pictures? Let us know in the comments below. I am working up something VERY cool for Woof99/Woof100! Keep an eye out here for details by the end of the week! I vote for the MTTS DVD as well. And a coffee table book of the pics! Put me on the list for a DVD. I’m listening right now and just heard the cell phone law discussion. What are all the cops going to do? I haven’t seen a cop driving without a cell phone stuck to his ear in years! 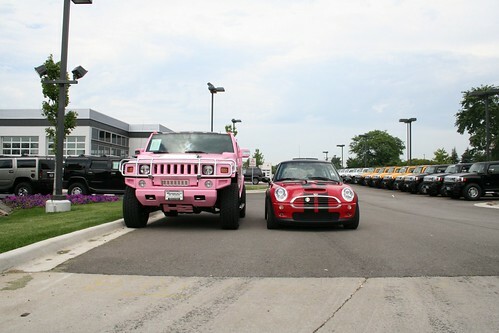 Regarding Hummers, have you noticed the irony in their current TV ads..? They have some ‘magician’ making Hummers disappear. They think it shows big sales, but they seem to have failed to realise their dealers have parking lots full of the things that no-one wants and a magician is the only way they could get rid of them. THE REASON I’VE HEARD THAT ONE LIGHT IS ON ON THE REAR OF SOME OF EURO VEHICLES IS BRIGHTER THAN OTHERS IS FOR VISIBILITY ON THE AUTOBAUN. I HEARD THIS AT A SAAB DEALER YEARS AGO…IF I AM WRONG PLEASE SOMEONE LET ME KNOW!!! An MTTS DVD would be ok… but I really think an MTTS pop-up book would be the way to go. The reason for the one bright rear light is for use in fog. In the UK it is mandatory to have one and it must be positioned between the centre or offside of vehicles first used on or after 1 April 1980. Cars before that date are not required to have one but if they do it must work. They should not be used (in the UK) unless visibility is seriously reduced 100 meters or 328ft as they dazzle other road users and can obscure your brake lights. You MUST switch them off when visibility improves. I’ve been waiting for so long to hear the word “wanker” in a woofcast. Excellent! I happen to live in a neighborhood filled with F250 super duty mega small man’s disease trucks and love to give everyone the business about it. Would love a DVD of the event!! Yeah, it’s pretty bad, isn’t it? Even StoopidGirl [thought it was a bit much](http://flickr.com/photos/blalor/208636111/in/photostream#comment72157594227108883), and she owns a pink Cooper! Hey… the Hummer comericals in question are no longer on their site!